From Provincetown to Hawaii, Alaska to New Orleans, this Englishman with a wry sense of humor and biting satirical wit observed all the cultural icons of the decade spanning the mid 1950s to the mid 1960s. Searle followed the Nixon/Kennedy campaign trail, drew on the sets of TV shows such as Bonanza, Bewitched and F-Troop. He depicted the Duke of Edinburgh’s Royal Tour. He had his pens freeze while sketching in Alaska and sketched the casinos of Reno, Atlantic City and Las Vegas. Matt Jones has produced a full-color exhibition catalog featuring highlights from the exhibition as well as Searle tribute artwork, created by some of today’s top animators and illustrators. 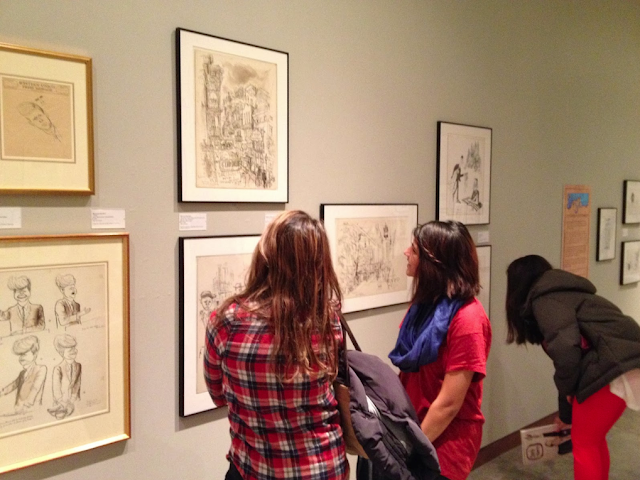 These works were auctioned off earlier this year to fund the exhibition and the catalog. 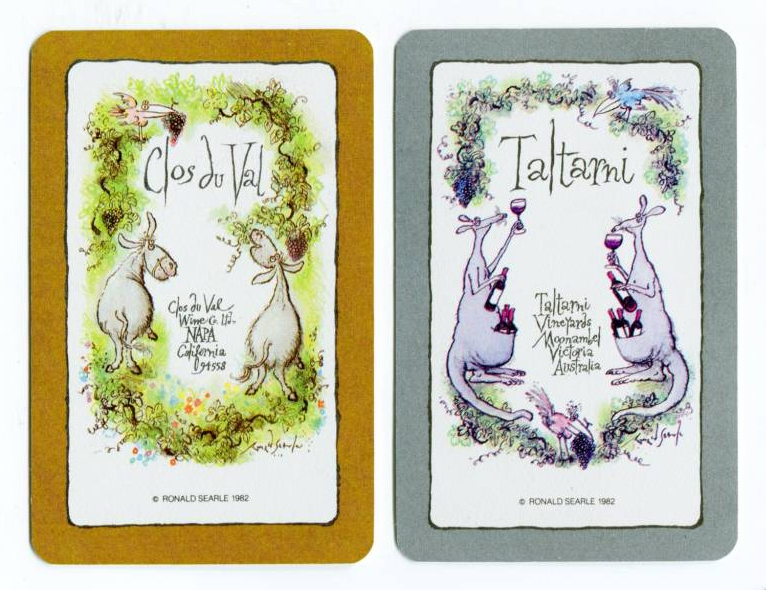 The Cartoon Art Museum wishes to thank The Clos du Val Winery of Napa, CA for their assistance with the exhibition. Searle illustrated several wine labels for Clos du Val in the early 1980s, and we are grateful for their continued patronage of his art. “Ronald Searle is known primarily as the creator of the wicked schoolgirls of St. Trinians and later his series of humorous books on cats and their foibles. The general public in the U.K., Europe and the U.S. hold these books dear, but to the artist they were merely ‘what sold’ and paid the bills. He even ‘killed off’ the St. Trinians’ girls in their last book in 1957; the year of his first visit to America. 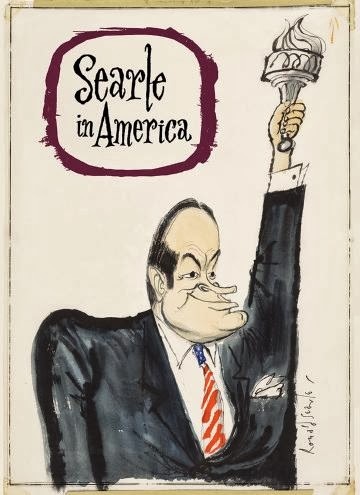 A household name in Great Britain, Searle would crack the American magazine illustration market under the guidance of his New York art agent, John Locke. “He spent over a decade between the late ‘50s and late ‘60s traveling extensively on reportage assignments for the premier magazines of the day: Life, Holiday, Look, Venture, Travel & Leisure. It was a golden era of illustration, where magazines had sizable budgets to send illustrators to exotic locations and commission substantial spreads of artwork. “Sadly, this work is largely forgotten. Holiday magazine was not published in Europe and is virtually unheard of in the U.S., slipping into decline in the late ‘70s. Searle republished some of this work in collected editions, but the books are long out of print. The original art has languished with art editors and agents for decades, and most remain unseen since their first publication. “Well I’ve found it! I’ve unearthed the lot. I’ve maintained a website devoted to Searle’s work since 2006 and even became acquainted with the artist himself while working in the south of France in the years preceding his death. Initially starting out of a love of his work and a desire to see more of it online, the site has become an essential database of an incredible career spanning eight decades! “I’ve traveled far and wide myself to track down the originals, and this show at CAM gathers some of the best. 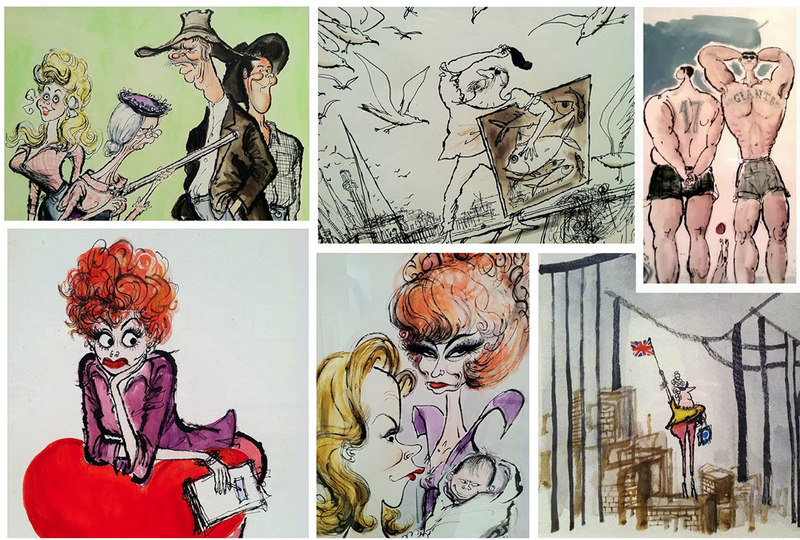 From collections in the Midwest, New York, Connecticut and California, I’ve assembled a show revealing my favorite era in Searle’s career. The golden period of 1955-1965 was a decade of intense work and travel, and the art has a vitality and urgency to it energised by the artist being constantly on the go. The work is a synthesis of his acute observational style and his ability to caricature figures, crowds and architecture. Most of the work is in full color, which will be a surprise to those only familiar with his monotone cats and schoolgirls. “This catalogue is laid out in an unorthodox manner. I wanted to present the work uncropped where possible without it being split across two pages; hence the dual portrait/landscape format.